After three consecutive days with temperatures over 85, change is in the air. Low pressure is intensifying over the foothills this afternoon and as a result the chance of thunderstorms is on the increase. East of a line from Greeley to Byers will be where the greatest threat for severe storms will be. Large hail, damaging winds and tornadoes are a distinct possibility. Closer to the foothills and the metro area, late afternoon and evening will bring gusty winds and a chance for small hail. Scattered showers are possible through midnight. The slow moving low will help keep temperatures down near normal for the foreseeable future after today however they also will provide for a chance of thunderstorms each day. Some of these storms may become severe although telling where and how widespread this activity will be is difficult. Certainly the northeastern plains have the greatest chance to see some excitement. A number of advisories are in place at the current time. The southeastern part of the state is under Fire Weather Watches as things are tinder dry. In the mountains, much of the state west of the Continental Divide is under Flood Advisories. The recent warm temperatures have spurred fears of faster than normal snow melt and many rivers and streams are expected to reach flood stage. This time of year just about anything can be expected. Keep an eye on the skies – especially if you are going to be outdoors for the upcoming holiday weekend. 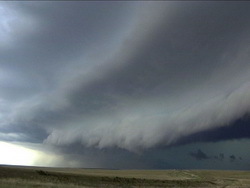 For those that have seen the Discovery Channel’s StormChasers TV series, you may find it interesting to know that I have just learned that the StormChaser team is currently in Fort Morgan at this very moment. As mentioned above, severe storms are likely over the northeastern plains this afternoon and evening and they apparently are there expecting the same and hoping to get some good data. For those that haven’t seen this series, it is a MUST SEE for anyone interesting in severe weather or storm chasing! This entry was posted on Wednesday, May 21st, 2008 at 1:52pm MDT and is filed under Colorado Weather, Severe Weather, Thornton Weather. You can follow any responses to this entry through the RSS 2.0 feed. You can skip to the end and leave a response. Pinging is currently not allowed.